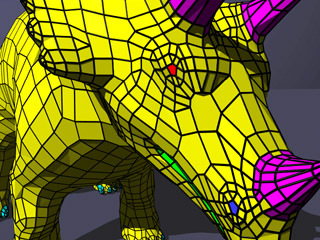 Most schemes to compress the topology of a surface mesh have been developed for the lowest common denominator: triangulated meshes. We propose a scheme that handles the topology of arbitrary polygon meshes. It encodes meshes directly in their polygonal representation and extends to capture face groupings in a natural way. Avoiding the triangulation step we reduce the storage costs for typical polygon models that have group structures and property data. [is-ff-00.pdf] Martin Isenburg, Jack Snoeyink, Face Fixer: Compressing Polygon Meshes with Properties, Proceedings of SIGGRAPH 2000, pages 263-270, July 2000. [i-tsc-00.pdf] Martin Isenburg, Triangle Strip Compression, Proceedings of Graphics Interface 2000, pages 197-204, May 2000. ---> appeared as a journal version in Computer Graphics Forum, Volume 20, Issue 2, pages 91-101, June 2001. [i-tf-00.pdf] Martin Isenburg, Triangle Fixer: Edge-based Connectivity Compression, European Workshop on Computational Geometry 2000, pages 18-23, March 2000.